Then check out Dr. Tobias Optimum Omega 3 Fish Oil! With every Dr. Tobias product purchase, receive FREE access to the Dr. Tobias website. Gain access to Yoga videos, eBooks on weight loss, healthy skin, and more! iWATCH SPORT SWEEPSTAKES courtesy of Dr. Tobias! 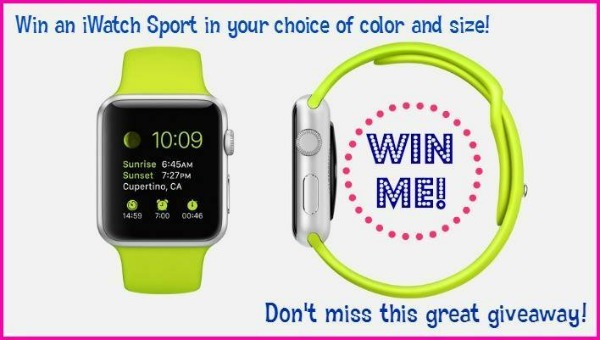 One lucky reader will win an iWatch Sport in the color of their choice. This giveaway is open to US Only. Winner will be chosen at random through Rafflecopter via Random.org. This sweepstakes ends April 18 at 11:59 PM ET. Winner will have 48 hours to respond before a new winner is selected. By entering the Rafflecopter you agree to the terms listed above. Disclaimer: The participating bloggers are not associated with any of the companies named above. No purchase is necessary to enter. Void where prohibited by law. The odds of winning are based on the number of entries received Open to US 18+ only. Confirmed Winner(s) (by Random.org) will be contacted by email. Winner(s) have 48 hours to respond before a new winner is chosen. No purchase necessary. Void where prohibited by law. The sponsor will be responsible for product shipment to winner(s) of this giveaway. My blog is not responsible for product shipment/delivery. This event is in no way administered, sponsored, or endorsed by, or associated with, Facebook and/or Twitter, Google, or Pinterest. This disclosure is done in accordance with the Federal Trade Commission 10 CFR, Part 255 Guides Concerning the Use of Endorsements and Testimonials in Advertising.